A Not-So-Blue, Blue Monday thanks to Tesco + Lots of Pizza! Apparently today is Blue Monday, also known as the most depressing day of the year. Christmas is over, everyone is broke, the weather is abominable and motivation is low, which means New Years resolutions are most likely to be broken today and people everywhere generally have the hump. 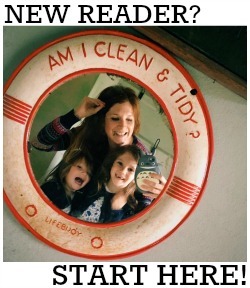 Now I'm a half full kinda-girl, and I don't really believe in all that tripe, but after a pretty horrendous week last week that cost me the best part of £1000 (two car break downs, having to throw out Evie's brand new mattress after Mabel decided to wee on it (cat for sale!) AND having my gas switched off due to a 'considerable' leak and subsequently having to call out an emergency plumber) I'm starting this week in a slightly less jolly mood than usual. 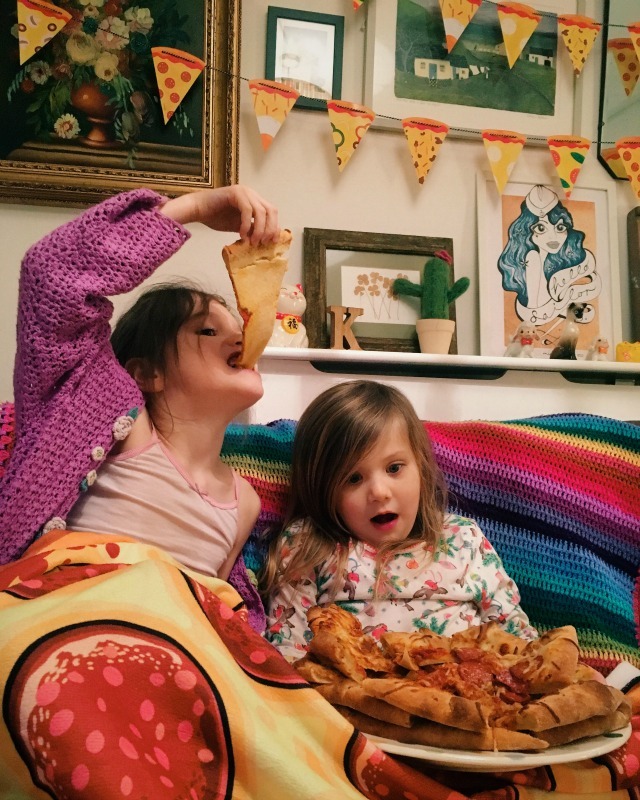 So we were pretty happy when Tesco asked us to be part of their Blue Monday campaign to promote their new takeaway inspired sharing pizzas - as an evening of pizza and sweeties, and a movie with family is a pretty good way to beat those January blues if you ask me! In our house, we have movie night every.single.Friday. We're big fans of all the old 80s and 90s family classics, and Studio Ghibli, and anything set in the 'olden days' (as the kids call it). 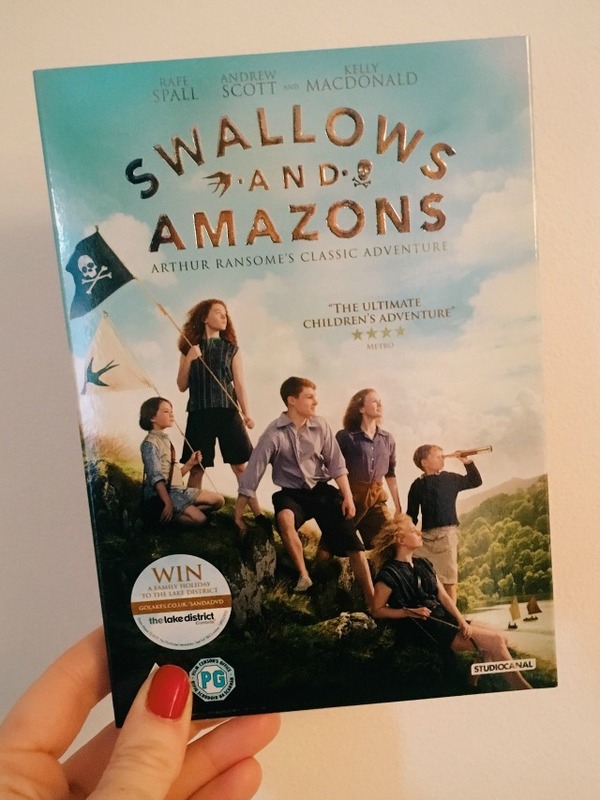 One of our current faves is the remake of Swallows and Amazons - which we were lucky enough to go to the premiere of! - and which is now available on DVD from Tesco for just £10 - so last Friday evening, at the end of a horrible week, we settled down for some much needed quality family time. Everyone knows that pizzas and movie nights go together like bread and butter, and peas and corn, and fish and chips. We got into our pyjamas, cranked the newly fixed heating up and cooked waaaaaaaaay more pizza than we needed (but still managed to demolish the lot between us!) 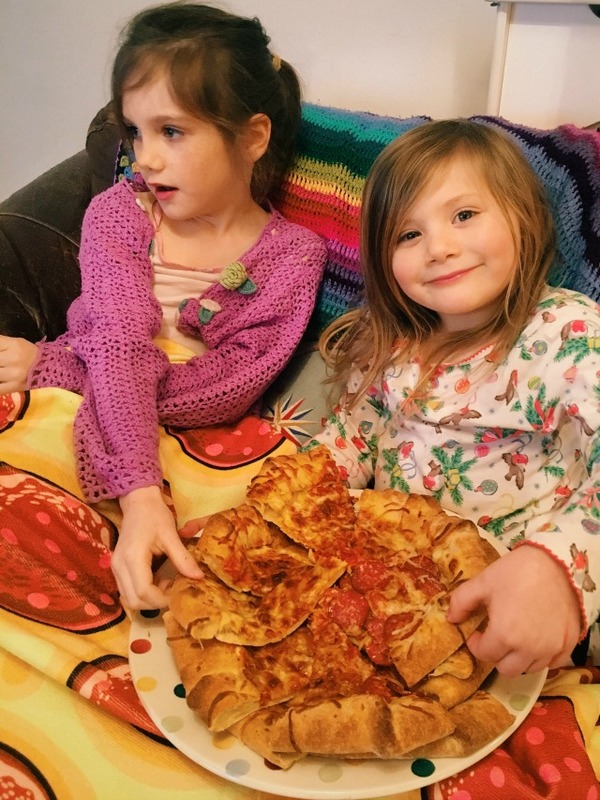 and settled down under a pizza blanket for the pizza party to end all pizza parties. Tesco's new range of sharing pizzas are inspired by everyone's takeaway favourites...... they are seriously big (14" no less!) and come with a range of different, popular, toppings including 'BBQ Chicken Supreme', 'Mighty Meat Combo', 'Hawaiian' and 'Veggie Supreme'. We went for the two stuffed crust varieties; 'Ultimate Pepperoni' and 'Cheese Meltdown', both of which were utterly delicious and a total bargain at just £4.50 each! When you think about the cost of ordering a takeaway, there really is no comparison - these pizzas are the perfect replacement when you're on a bit of a budget. 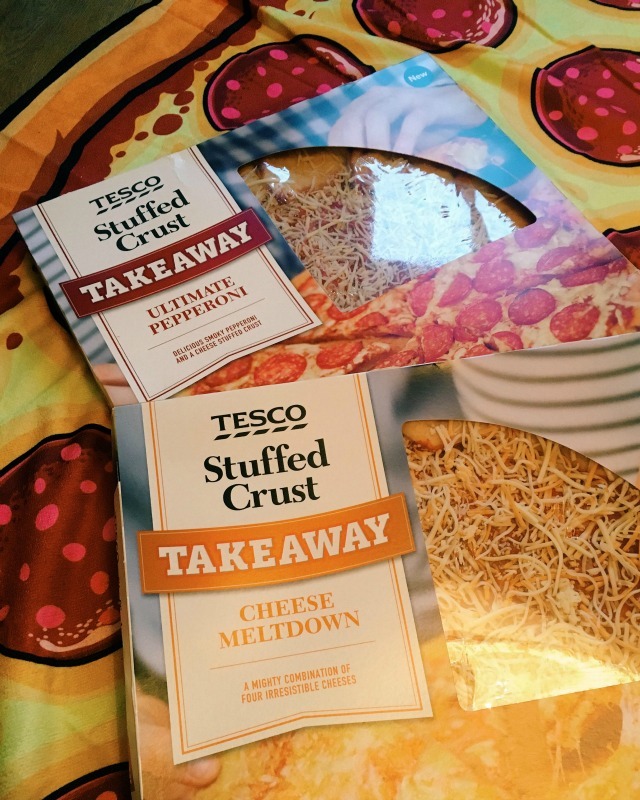 So if you're feeling a little bit blue today, get yourself to Tesco and pick up a pizza or two from their new range!